While a day will look very different for each person because of their customized care plan, it is helpful for some to see a typical day for a resident in our community. The goal of short-term rehabilitation is to help seniors return to their highest possible functional ability. For someone recovering from orthopedic surgery, this might be a combination of physical and occupational therapy. The goal of long-term care is to support the resident’s health and maintain their functional capabilities. For residents that are challenged by dementia, it might be more focused on speech and memory care. Residents can start their day enjoying a fresh cup of coffee and the newspaper. The day always begins with a nutritious breakfast in our community dining areas where residents have the chance to see their friends and talk about their upcoming activitiesor they can choose to dine in the comfort of their own room. Most residents start their rehabilitation activities after breakfast. For many post-operative patients, their rehabilitation goals mean they will have two or more therapy sessions every day. 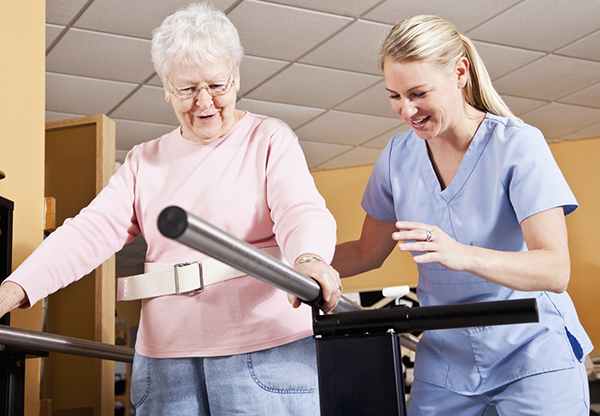 Therapy is conducted in our rehabilitation center that offers state-of-art equipment. Sometimes, lighter therapy sessions can even be held in the resident’s own room. Residents that are going through physical therapy frequently want to rest between sessions. Others that have a lighter therapy or treatment schedule in the morning frequently have time to participate in scheduled activities including games, book clubs and more. The afternoon starts with a nourishing lunch. Residents need to keep their energy up for all their activities! After additional therapy and care sessions, residents will take breaks or join their neighbors for more scheduled activities. Many outings into the local community are planned for the afternoon. This is also a popular time for visitors to stop by to see their loved ones. The typical day starts to wind down with a delicious dinner. Residents who are tired from their successful extended rehabilitation therapy can also request a private meal served in the peace and quiet of their room. Early evening entertainment might include a relaxing game night, movies or reading. Since many of our short-term rehabilitation guests are working hard to complete their therapy, they frequently call it an early night so they can rest up for the next day.